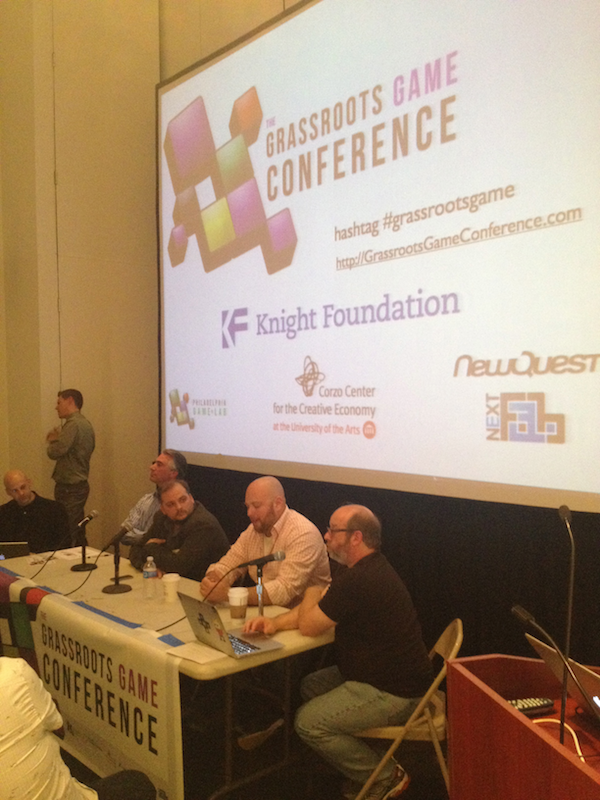 Wow, the first Grassroots Game Conference is complete! 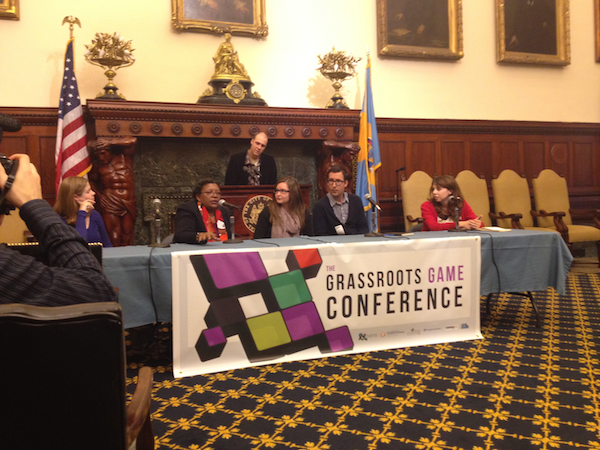 We held our first Grassroots Game Conference last week as part of our core mission of facilitating small team, creative game development, emphasizing its significance as a key trend in the industry today, and specifically highlighting the unique differentiators of Philadelphia in this area. 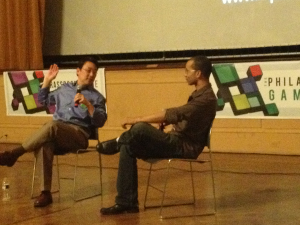 We presented this first year in coordination with Philly Tech Week, and PTW’s organizers were a great help in getting things moving. It was quite exciting for us that before even holding our first session, the best introduction to where we’re coming from and what we wanted to do with his conference came on a Pew blog. 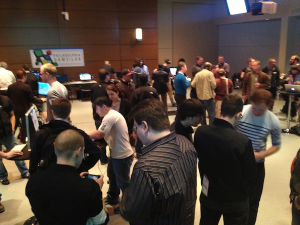 In the course of 19 sessions, and of our observations and feedback from experts across the spectrum of thought on game development, we were also able to further define the place we want the Philadelphia Game Lab to take in the greater ecosystem. -This will be the focus of an upcoming post. We feel incredibly fortunate to have had so much support from the Corzo Center, Knight Foundation (sponsor of the Games and Gamification for Non-Profits Track), the Philadelphia Office of Arts, Culture and the Creative Economy and cultureworks. From the local developer community, Tim Ambrogi of Final Form and Jake O’Brian of Philadelphia Unity Users Group and Flyclops collaborated with us on organizing sessions, and a number of others participated in sessions. Among other highlights, Dain Saint of Cipher Prime combined with Youngmoo Kim to provide a diptych of mesmerizing presentations, that ended up being both a stirring example of education as a product of play and a compelling dialog on that observation. Another was Monday night’s panel on Games as Art, when we were joined by Alyce Myatt of the NEA, Georgina Goodlander from the Smithsonian’s current exhibit on games, the makers of Indie Game: The Movie, and Sarah Brin of GlitchLab LA, all of which was moderated, and significantly enriched, by Chris Grant. Sarah also provided a wonderful presentation giving us an overview of the state of games as art at the grassroots level across the world. On Tuesday, we had some great folks coming into town to discuss use of games and gamification by non-profits, including Gabe Zichermann (who wrote the book, and runs the conferences, on gamification); Chris Lawrence of HiveNYC‘s unique and well-respected badge program; the brilliant and ASL-fluent Stephen Jacobs and our own Kevin Werbach, who ran a significant academic conference on gamification last year. An amazing thing about this session was that it was entirely free of hyperbole about the strengths or weaknesses of gamification. 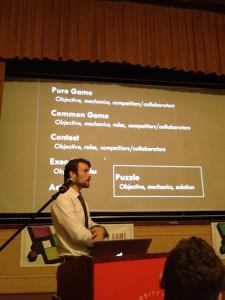 It was an extremely practical and insightful exploration of what gamification can do for good. After that session, David Gloss, a local expert in uses of gameplay and social elements was joined by Dianne Debicella from Fractured Atlas to go into depth on the specific impact and benefits of fundraising in a game or gamified environment. It turns out (based on hard numbers presented) that people who donate to social good from within a commercial system tend to be significantly more committed and valuable clients of that commercial system. Outside of the events we held, we were lucky to be able to convince the makers of Indie Game: The Movie to hold a showing on Tuesday night in collaboration with the conference. And on Wednesday night, the Philly IGDA put on its annual display of locally developed games, showing a diversity of games, and a really great vibe of camaraderie. One of the coolest things that happened in the week was when Tim Ambrogi pulled together a panel of three teams of successful indie developers in Philadelphia (moderated by Chris Grant), who articulately described vastly different approaches and business models for game development, all within the context of why Philadelphia is the best place for them. 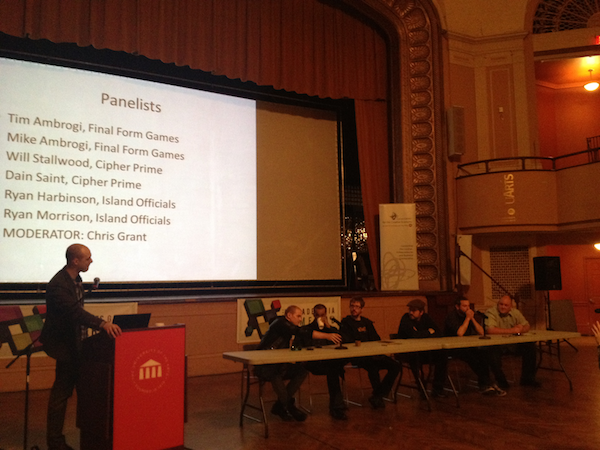 We have to add a special mention of the great positive energy and thought brought to several sessions, as, varyingly, panelist, presenter, and audience, by the guys from Obscure Games in Pittsburgh. I’d also like to thank Jerome Cathaud from newquest, who built the fantastic graphic identity for the conference (riffing off his design for the Philadelphia Game Lab) and NextFab for doing some great signage for us. This has just been a bit of a stream of consciousness post, to get some thoughts up one day after the conference ended. I know that I’ve missed mentioning loads of great participants, and I hope to get to more posts over the next week. We have videos for almost all events, and we’ll post them and presentations as soon as we can get all of that organized.